In order to avenge his father's death, Ryu had come to America, where he was suddenly attacked by a mysterious army. After escaping from a narrow brush with death, Ryu came face to face with a mysterious woman. Fire came shooting out of the shining gun in her hand, and suddenly everything in front on Ryu began to grow hazy. Waking up in an underground dungeon, Ryu was handed a strange statue by the same woman, who told him to take it and make his escape. Without fully understanding what was going on around him, Ryu took the statue and made his way out of the enemy territory. Ryu then went to see Dr. Smith, an archaeologist friend of his father, and learned about the light and dark statues of an evil demon. Just as they were talking, the dark statue was snatched away by an enemy ninja. After retrieving the statue, he returned to Dr. Smith's cabin only to find the doctor lying on the floor, mortally wounded. Just before he died, the doctor whispered, "Ryu, now the light statue has been taken..." When Ryu looked up from Dr. Smith's side he found that he was surrounded by a band of men dressed in black from head to foot. They were all pointing their guns at him. These men took Ryu to a secret CIA base and to the office of Chief Foster. Foster explained to Ryu that the mysterious woman, Irene, was really a spy for the CIA, and told him about Jaquio's plans and about his Temple of Darkness. Foster then forced Ryu to take on the perilous mission of recovering the stolen light statue of the evil demon. Ryu made his way toward the Temple of Darkness located deep in the Amazon jungle. But Jaquio, who was holding Irene hostage in the temple, blackmailed Ryu into giving up the dark statue of the demon that he had been carrying and dumped Ryu down into an underground cave. Ryu was finally able to escape from the cave, but as he climbed over the last cliff, he came face to face with the villain who had killer his father, Bloody Malth. Malth had been waiting for him. Ryu and Malth duelled to the death. With his last breath, Malth gave Ryu some unexpected news: "Your father is alive." A masked demon was waiting inside the shrine to fight off Ryu's attack. Ryu shouted, "Nobody can beat me!" But the eerie voice of Jaquio thundered the question, "Not even your own father?" The masked demon was really Ryu's father Ken who had been put under some kind of trance. Finally freed from Jaquio's evil control, Ken came to his senses only to find that Jaquio was about to kill Ryu. Ken threw himself in front of Ryu, and acted as a shield to protect his son from the balls of fire. Realizing what had happened, Ryu went mad with rage and charged at Jaquio. After defeating Jaquio, Ryu rushed back to his father's side. His father instructed him to take the light and dark statues of the evil demon out of the temple. But just as Ken was gasping this message to his son, the moon began to grow in the darkness. The moon, blackened by the earth's shadow, was beginning to bring the evil demon back to life. But the evil demon was finally defeated, and the temple crumbled upon itself with a deafening roar. Ryu and Irene looked out upon the ruins of the temple. The morning sun shone down upon them and cleared up the deep sense of darkness and evil that had once hovered in the air. A year has passed, and still the activity down at the bottom of the realm of darkness continues. Ashtar, the evil lord who secretly controls Jaquio, is now on the move. --From the NES Ninja Gaiden 2 instruction manual. 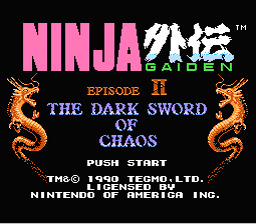 Play Ninja Gaiden 2 Now! Ninja Gaiden II was a very fun game. The ability to stick to the walls and climb up them was genius. The only thing I didn't really like was that some of the special weapons were really hard to use effectively. The graphics for this game were really good. The bad guys were easily recognizable. The backgrounds looked pretty real too. Use your ninja skills to save the world from Ashtar. On the title screen, hold up+left, select, A, and B all at once. Then press start.